Shastri Benoît Côté marks the transition of the past year in the Sakyong’s reign by offering a history of twenty years of ruling and teaching. This is the first in a series of articles about this journey, based on available documents that mark the various periods and drawing on words spoken or written by the Sakyong during that time. In the coming days, the Shambhala Times will feature a moment in time. Journey with us to engage your own history and review, re-encounter, learn, or understand anew. In 2010, the Sakyong, Jamgön Mipham Rinpoche has crossed the age that his father had when he passed away. For somebody like him, this is considered as a time of obstacles and that is one reason why he decided to do a year of retreat. 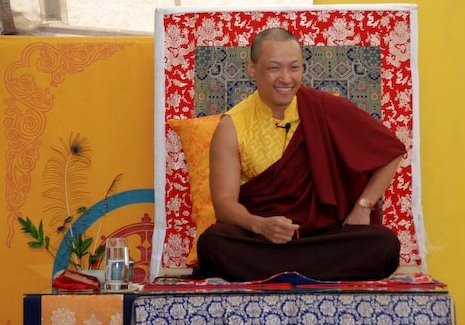 But this is also the fifteenth anniversary of his being empowered as the second sakyong of the Shambhala lineage, and the twentieth anniversary of his becoming head of the Shambhala organization. A lot has happened in those twenty years. Here is a brief historical survey based mainly on available documents. I would like to get this in my email inbox. It would help with the Don season. You can subscribe to an RSS feed if you’d like to get the Shambhala Times in your inbox. If you are part of the Shambhala Network, a weekly summary of top stories will automatically arrive every Sunday.